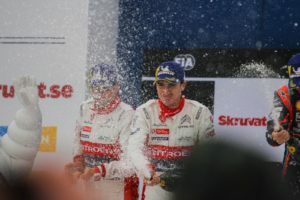 Ireland’s Craig Breen showed his class all weekend by scoring his best result in a World Championship Rally, bringing his Citroen Total Abu Dhabi WRT Citroen C3 to a superb second place overall in Rally Sweden. This was also the best performance ever by a driver from the Republic in the WRC, with the Waterford ace and his British co-driver Scott Martin less than 20 seconds behind the Hyundai of Belgian World Championship leader Thierry Neuville at the end of three days of snow-covered stages. Breen started his rally sensibly, holding eighth place on Thursday’s short shakedown stage, behind his teammates Mats Ostberg of Norway and Tyrone’s Kris Meeke. However, when the rally proper got under way on Friday, the Irishman took full advantage of conditions which improved as each car went through the stages, ending the day fourth. On Saturday, he climbed to second spot, 22 seconds behind leader Neuville and ahead of the other two Hyundai drivers, while Ostberg could only manage fifth position, more than half a minute behind Breen, and Meeke slid into a snowbank and couldn’t finish the day’s stages. Yesterday, Breen closed the gap on Neuville by three seconds, to record an historic podium placing – his first and the first for an Irishman. Afterwards, Breen said “I’m absolutely on top of the world! It has been an incredible weekend. I have always really enjoyed this rally in the past, but I have to say that I surprised myself this weekend in that I was able to fight at the front throughout the race, without making any mistakes”. Former National Rally champions Roy White and James O’Brien headed a top quality leaderboard in the Birr club’s Abbey Court Hotel Stages Rally at Nenagh, finishing 21 seconds ahead of Donagh Kelly and Conor Foley, with the new pairing of Declan Boyle/James O’Reilly taking third place after six stages. Fergil Gregory took the honours in the Leinster Sporting Trial at Ashford following a tie-deciding run-off with Joe McCann. At Mondello Park, the Murray Motorsport team of John Denning, Michael Cullen, Barry English and Hugh Grennan took victory in the 6 hour Endurance Race for Ford Fiestas, leading for the final hour after a race-long battle with the Mr Gearbox Mr Clutch quartet of Alan and Keith Dawson, William Kellett and Sean Woods, who finished 32 seconds behind.